I’m still devastated thinking about the individuals who died and those close to them whose lives will never be the same. Khaled Beydoun is raising awareness of lives lost on his Instagram page, as is Kashmir Maryam on her Facebook page. This particular picture above, shared by Khaled, is of Atta Elayyan, a father, husband, son, and tech leader. Atta is pictured here with his new daughter and wife, Farah. Atta did not survive the Christchurch attack. Can you imagine Farah telling her daughter that Atta will never come home again? I find myself more enraged with these recent attacks. What else can be said about the violence of white supremacy and the abundance of hate in our world? How many more tears can we shed? How many more times can we pretend like our own President’s xenophobia and policies don’t enable and perpetuate such horrific acts? How much longer can we deny the interconnectedness of white nationalism, right-wing Christianity, racism, and Islamophobia? How much longer can people of moral conscience be silent? I am confident that we can’t do this for one.day.more. Not when our sisters and brothers aren’t able to pray without fear of being shot. Not when our sisters and brothers aren’t able to imagine walking outside without being shot. Is this the world you imagine? If not, we must oppose anti-immigrant policies, or else we enable its terrorists, Jonathan Wilson-Hartgrove reminds us. It is not enough to condemn Islamophobia. We must actively work against it. While this might seem daunting and overwhelming, because quite frankly, yes, the rise of white supremacy is so violent and problematic that it IS daunting, we simply can’t do nothing. Here are three small yet significant things you can do today. Reach out to a Muslim friend. Let them know we will fight with them, pray with them, and stand with them. Remind them that love is stronger than fear. Have conversations with the young people in your lives about the different ways people worship God and practice religion. Our differences are our greatest strengths. Our conversations should focus on relationships and learning rather than conversion and othering. Simple phrases like the ones below can go a long way towards celebrating differences and eliminating fear and superiority. 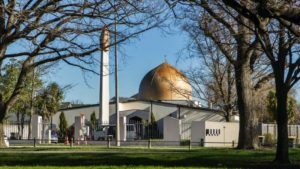 Sign this petition and send prayers to our Muslim family in Christchurch. What suggestions do you have? Can we imagine a world where white supremacy doesn’t kill? What will it take to get there? Let’s imagine together. *Excerpts from this article first appeared in an article for The Resistance Prays on March 16th 2019.